JohnnyTwoToes critiques why this is the worst Die Hard sequel ever! Let me put this review in a nutshell when I start - this is a BAD movie! A Good Day To Die Hard (2013) TOTALLY loses sight on what made the Die Hard franchise such a great one - great good guys and really hideous bad guys. That is what makes them so accessible to the audience worldwide. We are able to relate to the iconoclastic character John McClane because we both know that the bad guys need to be stopped and their nefarious plans destroyed. In this edition, you find this appeal completely missing coupled with a terrible script! 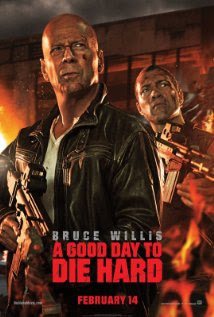 Here's how the story goes - A Good Day To Die Hard (AGDTDH) has Bruce Willis going to Russia to save his son who has been arrested for murder of a Russian governmental official. We never know what the plan is since nothing in this film makes any sense, AT ALL. There are two Russian officials that seem to be battling for a file that holds the key to what happened at Chernobyl and effects the new leadership in Russia. Kamarov (Sebastain Koch) is in prison at the start of the film and has the file hidden from the new Russian leader, Chagarin (Sergei Kolesnikov). When Kamarov is being arraigned he is placed in a glass box next to Jack McClane (Jai Courtney) who is also being arraigned at the same time. This is just when John McClane arrives at the courthouse. What happens next defies logic. The bad guys are there and blow the place to kingdom come. Since Jack is actually a CIA operative his plan was to break Kamarov out. How? Did Jack know the bad guys would blow the place up and make it possible for him to whisk Kamarov out of the country? His whole plan seems to hinge on the bad guys doing what they do. How did he know that? He does not seem to have a plan and to rely totally on a CHANCE the bad guys would do what they do is quite a stretch. As the film progresses you will see none of this makes a bit of difference. John McClane shows up and for the next 90 minutes (that's right; 90 minutes. All of the other Die Hard films are at least 2 hours.) we are served up a buffet of inane car chases, explosions, and gunfire. Don't get me wrong. I have no problem with violence in films. But in AGDTDH, the violence is thrown at the screen and nothing sticks - badly choreographed and badly edited! Jai Courtney and Bruce Willis have no chemistry on screen and for the few seconds that the carnage stops, we are treated to a stale and recycled father and son bonding moments that are simply terrible. There is nothing that seems heartfelt and both the stars are basically going through the motions, cashing a check. I cannot tell you how disappointing it is to see such drivel in a Die Hard film. There is nothing in AGDTDH that works. The action scenes drag on too long and there is nothing that connects them except a lame script that is not funny, witty or intelligent. The supposed surprise in the last half of the film does not work, either. The bad guys are so weak you know they could be beat in just a few seconds in real life, not the Die Hard calibre. John Moore directs this film with all of the subtlety of a brick through a window and this is a guy who can do action films. Remember Owen Wilson's Behind Enemy Lines (2001)? He also directed two remakes, The Omen (2006) and Flight Of The Phoenix (2004) and although they are not as good as the original classics, they were done with some class as homages to the originals. AGDTDH joins Moore's other hyped-up dud Max Payne (2008). Jai Courtney who was in Jack Reacher(2012) with Tom Cruise seems to stumble all along the entire script while Bruce Willis sleepwalks muttering insipid lines of satirical wisdom. The only characters that bring light to this crap is Mary Elizabeth Winstead as McClane's daughter and the intense Cole Hauser as Jack's CIA boss Collins. But since both are in the film scant minutes we are denied even a fleeting moment to enjoy anything good about AGDTDH. Anyway, the only thing that works through this film and kept from shutting it off completely was Marco Beltrami's fine score. This is a composer that has grown on me over the years and the score he has composed for this film is simply terrific. A word of advice is to buy the score, not the film BECAUSE its boring, dull, uninteresting, incoherent and just plain silly. In fact, if you pay attention, you can also see many goof-ups - visible audio equipment, cameraman reflections, etc. There is a 'Director's Edition' that has surfaced from the bowels of Hollywood with a whopping 4 minutes of additional footage. Don't bother. Four additional minutes or forty minutes of additional footage would not do this wretched pile of celluloid any good. It adds nothing to the story, characters or plot let alone the entertainment value of this mess. Invest in the score by Marco Beltrami, instead.